The best actors can own an entire scene without having to once open their mouths. There’s no chance for ridiculous annunciation or offbeat breath draws. There’s less of a chance for, as Jon Lovitz put it on Saturday Night Live, “ACCCCCCTING!” If you can suspend my disbelief long enough to make me see not just an actor, but a character, you’ve done your job well; if you can do it without relying on words, it’s a sign of a level of sophistication at which many actors fail to arrive. Bearing that in mind, I have to applaud Battle Royale for the litany of good actors it provided. For a film that featured a massive amount of violence, the most impactful moments occured when the actors did not utter a line. Starting at the beginning, we see the winner of the previous Battle Royale post-victory. She’s covered in blood, her smile reveals braces, and she’s clutching a doll. There’s something beauty-queen-esque about her smile: that look of winning, of having clawed her way to the top. Juxtaposed with the blood, the doll and the braces, this girl is jarring when we first see her. She scared the crap out of me without having to say a word. Something tells me her platform isn’t world peace. Working our way through the film, we get to witness those small indicators that something is wrong, even though the discomfort isn’t explicitly voiced. Did you catch the look on the Mr. Hiyashida’s face as the students’ bus passes armed military vehicles? Yeah, that look of fear. He knew something was wrong and didn’t want to say anything to alarm the kids. The whole expression takes under 15 seconds, but it’s there, and it’s effective. Just as effective? Nobu’s interaction with Kitano during Kitano’s introduction to the game. Kitano gets to address his attacker, the kid that stabbed him some time ago. Nobu doesn’t verbally confront Kitano at first: he shifts guiltily in his chair, moves around, then makes a face at him. This is an interesting choice: the kid knows he’s in trouble, that he’s been confronted for an ill deed, and that he’s being publicly picked on by someone who now has a lot more power than previous interactions. Nobu’s response is childish. It reinforces that there’s still a child in there. As much as I disliked Nobu in the film (but not in the book, which, if you haven’t read, you absolutely need to – it’s even better than the film, which is a masterpiece), he’s still a child. When Nobu dies, Nanahara does not yell and scream. He cries while everyone else watches silently. There are mixtures of pity and indifference in the facial expressions, but we are able to read these emotions without dialogue. Eventually, Nanahara has to be restrained, but Nakagawa only has to give him a look to calm him down. She tempers a rash reaction that would have killed him with one look. Her silence is her power. Nakagawa does not have to make a dramatic speech. She quietly reassures. And we believe her. We know that she’s trying to help Nanahara live to see the end of the battle. She’s successful because he picks up on this too. All without a word.In terms the gathering of the bags, this group does this quietly as well, yet we all read their expressions. The pain, the rebellion, the sorrow. Out of the 15 or so kids we see grab bags, we only have three speakers, one of whom is Kawada demanding a new bag. There’s no dramatic speech because it won’t do any good. The fight is inevitable. These kids grasp the finality of the sitation. Even Kiriyama, who does not speak for the duration of the film, clutches his bag as though it’s a baby; he willingly signed up for the game of the film, and so in a sense, this is his baby. Ironically enough, Kiriyama is the one that survives to the final four and executes the most kills. His silence is just as much an asset as a gun. He does not have to deliver speeches, or give backstory. He’s the worst type of Big Bad Wolf: the one that you can’t sympathize with because there’s nothing really human in there. We can’t connect in small ways, even if it’s pity (like with Mitsuko): we don’t know. All that we know is that he will creep up on you, smile and kill you. The smile conveys that he takes glee in the act. He does not feel remorse. We don’t want him to win because there’s no inkling of a soul there. He doesn’t beg for his life when confronted. His lack of explanation renders him a type of strength that the other students don’t have. There’s really no expression to read here. In fact, talking becomes a type of weakness for the characters in that it wastes time, especially when dealing with Kiriyama. While Mitskuo is an effective killer, she continually rages about the injustices she experiences in her social life, which weakens her. She screams when fighting Kiriyama; ultimately, he survives while she dies. Likewise, Mimura stages a silent rebellion with typing and computer hacking once he figures out that the necklaces have microphones; however, when his group gets attacked, he starts yelling as his friends die. There’s a direct correlation between the act of speech and the lowered chances of survival against the silent killer. The most damning example we have of speech decreasing the chances of survival is the group of Lighthouse Girls. Yukie, Yuko, Haruka, Yuka, Chisato, and Satomi all fall prey to in-fighting, which causes a gun fight and eventual death for all. 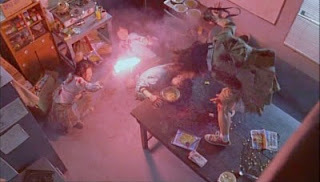 While this stems from an act of murder (poison intended to kill Nanahara), the group makes accusations, quickly turns on each other and resorts to killing each other off in no time flat. Really, it takes a grand total of about 5 minutes for them to off each other. That doesn’t bode well for the power of speech. When do we get to see the positives of silence without the murder? Kawada cares silently for a recovering Nakagawa. Nakagawa’s wordless dream sequence of eating ice cream with Kitano instills a sense of pity in her. Kawada’s quiet death – which he likens to going to sleep – is peaceful and moving despite that he’s covered in blood and has rampaged for nearly three days with our heroes. These instances make the characters more human. We read their expressions and, despite the language barrier, we can sympathize with them. We feel their sense of peace and search for understanding. We connect. Battle Royale is, at its core, a deeply violent film about a horrible socio-political situation involving children. It’s horrifying, even more so because we see these kids as people. Any actor could have come in and read the lines. The actors of Battle Royale came in and became these people, lending their faces and emotions to the sacred teenagers to give them more facets. Some dramas can’t accomplish what a horror movie did. The credit goes to the acting and direction. Well played, kids. Well played.